I thought I'd never say this... but sometimes, wine just doesn't seem to make sense. Or perhaps my wine courage has found its limit, 'cause I just don't know what wine would stand up to this food. 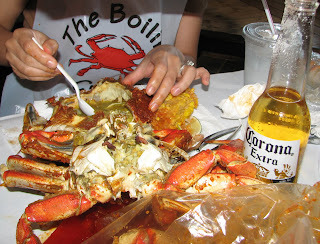 In the middle of mostly Vietnamese area in San Jose is a hole-in-the-wall most awesome seafood joint, called The Boiling Crab. Combining Asian with Cajun sure makes for one hell of a blissful and unbridled foodie experience. Well, apparently this is no secret for the crowds standing in line for hours to get in. Even at 2pm on a Sunday, we had to wait for well over an hour. Oh, but the smell that hits you when you just open the door is so deliciously haunting! 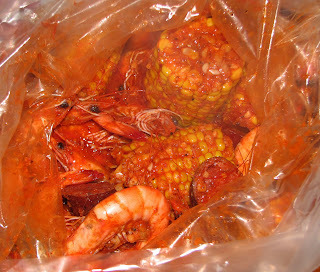 Their shrimp/corn/sausage combo delivered in a giant plastic bag packed in a "rajun cajun" hot, tangy, garlicky sauce is shockingly strong and flavorful, awakening the farthest, most dormant zones of your taste buds that you didn't even know existed! Taking part in the zesty symphony are the most succulent spice-infused corn and an amazing smoky and tangy andouille sausage not to be ignored in the presence of the shrimp cornucopia. The cajun seasoning is so good, even dipping ordinary fries in it works like magic. 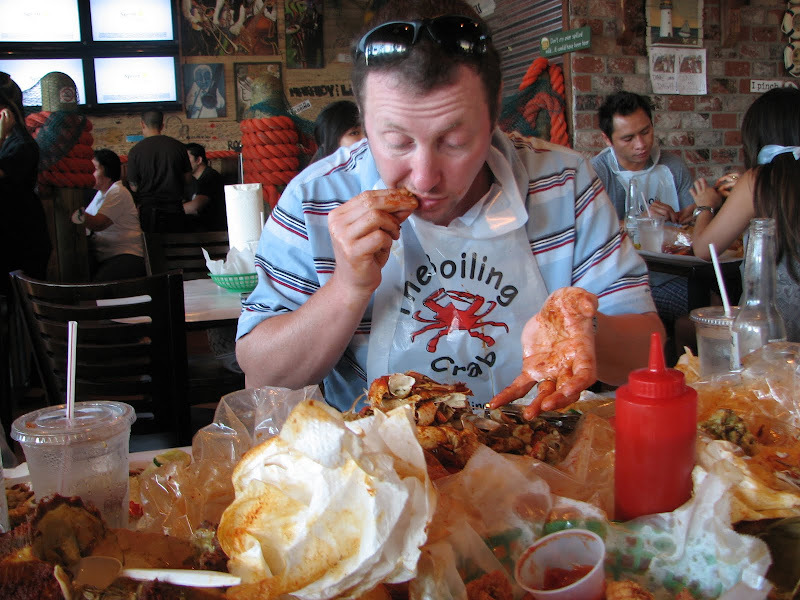 Next time I am going to try crawfish and fresh oysters which the "regulars" seemed to be devouring in buckets! Pounds of sea creatures consumed, beer gulped, sauce inhaled, spicy splatters wiped from my burning eye, the question weighs heavy on this wino's mind - was Corona the best we could do!??? But if y'all wine people reckon you have a wine recommendation that can withstand the "rajun cajun" knockout punch, do let me know.